Intrigued by the mechanisms that generate a world like ours, in which over 33% of the wealth in the U.S. is held by 1% of the population, economist Ricardo Fernholz and mathematician/statistician Robert Fernholz developed a model that might explain the high degree of income and wealth inequality we see in advanced economies. The model assumes that all households are identical with respect to patience (consumption decisions) and skill (earnings ability). Household outcomes differ solely because they have idiosyncratic investment opportunities—that is, they can’t invest in the market, only in things like privately-held businesses or unique pieces of real estate. 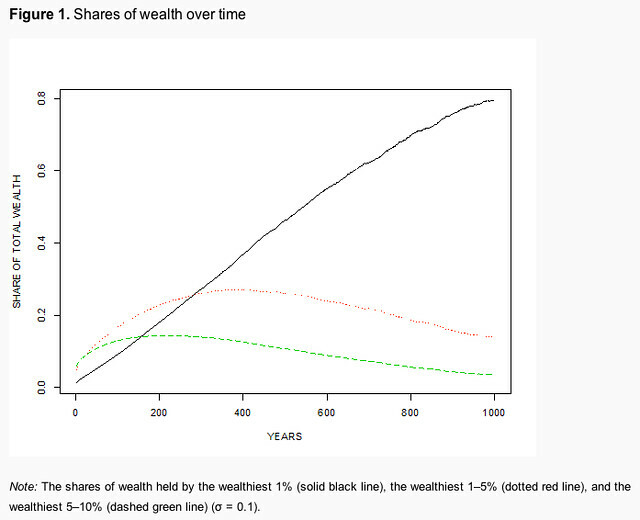 Yet when you simulate the model, you see an increasing share of wealth finding its way into fewer and fewer hands [as illustrated in the chart above]. …this is a useful antidote to the widespread belief that outcomes are solely due to skill, hard work, or some other “virtuous” attribute. Even if everyone starts off equal, you’re going to have a few big, big winners and a lot of losers. Because we want to find order and meaning in the universe, we like to think that success is deserved, but it almost always comes with a healthy serving of luck. Bear that in mind the next time you hear some gazillionaire hedge fund manager or corporate CEO insisting that he knows how the country ought to be run. Read a summary of the Fernholzs’ paper here; download the (rather mathematically-intense) original here. 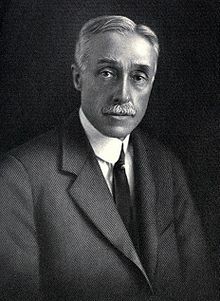 As we ponder polarization, we might send balanced birthday greetings to Elmer Ambrose Sperry; he was born on this date in 1860. An early exemplar of equipoise, Sperry was the engineer and inventor who devised the gyrocompass (a huge advance on traditional magnetic compasses, first tested on the U.S.S. Delaware in 1911). His compasses and stabilizers have helped navigate and “balance level” first ships, then aircraft ever since.